Super Hero Boy: Something all the kids will be talking about! Something all the kids will be talking about! 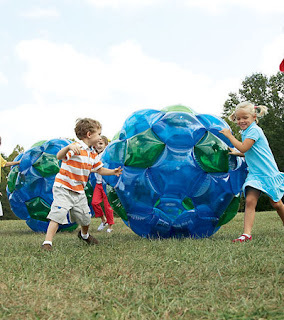 If you really want to leave a group of kids speechless at a birthday party or family event just bring out a GBOP (Great Big Outdoor Playball) and you seriously will leave them talking about it for the rest of their lives. The GBOP blows up to be an astounding 52" in diameter. Its easily as tall as I am, not that thats really saying much, and though its rated for children 6 and over, everyone can get in on the action. The Great Big Outdoor Playballl is just that, a HUGE ball which a hollow middle. 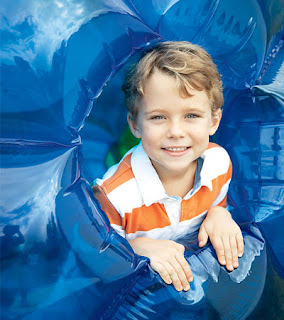 Children can push, throw, or even ride inside the ball like its a huge hamster ball. I'm not terribly sure why but nothing seems to impress a kid more than the fact that they can actually get "inside" the ball. And though Connor is not nearly old enough to be pushed around inside the ball he certainly got a kick out of the fact that the can crawl through the ball while I hold it stationary. And though it says ages 6 and up you would think that it would be sutiable for only smaller children, but I actually can get inside the ball easily enough and though I think I'm past the point in my life where I enjoy rolling around inside a ball, but it certainly can be done. The Great Big Outdoor Playball works best on soft surfaces such as grass, and seeing as its made of vinyl I would be wary about using it on hard or rough surfaces. We used our briefly indoors and out in the grass with no issues but I wouldn't want to risk playing with it on our rough concrete especially with a child inside of it. The good news is if you spring a link in one cell of the ball you wont end up with a flat ball right away. The ball itself is made up of quite a few tiny compartments which all separate of each other. Though you most certainly can patch any holes you may make, no need to panic if you spring a leak right in the middle of a birthday party as the hole will be pretty isolated. Honestly the only bad thing I can say about the GBOP is the fact that it does take a good long while to get it inflated. I actually gave up the first night I attempted to get it fully inflated as it was late when I started and I got about halfway through it and decided to leave it for the next day. Connor however thought this was a great idea as inflating the GBOP actually made sort of an "igloo" and Connor had the best time crawling in and out of the hole in the side of the GBOP. He used it as sort of a clubhouse for a few days until I finally decided enough was enough and finished filling the Great Big Outdoor Playball. I did however forget that the ball would actually end up being bigger than my door frame and had to deflate it a bit so I could then get it outside. Regardless about the time it takes to fill it up, for a small amount of money you can really make an impression in your party guests that will truly last a lifetime. I mean honestly, how many kids have a ball bigger than they are that they can actually crawl inside?! The Great Big Outdoor Playball is available for purchase at Hearth Song. I highly recommend you purchase the optional electric pump as well as it makes inflation a breeze! I just checked out the site and it has a lot of cool items and the price is good on most of them. Thanks for introducing me to another great site. Hey there! I'm thinking of buying the GBOP for my daughter's fifth birthday party. It looks fun! I'm curious to know how yours has held up over the past year.